Russian scientists believe they have discovered new life forms sealed off for millions of years in a subglacial lake deep under the Antarctic ice, the RIA news agency reported on Thursday. After more than a decade of stop-and-go drilling, Russia pierced through Antarctica's frozen crust last year and took back samples of water from a vast lake that has lain untouched for at least 14 million year. 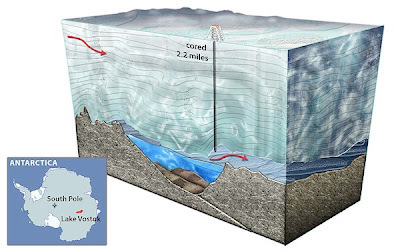 Scientists say the icy darkness of Lake Vostok, under some 12,139 feet of ice, may provide a glimpse of the planet before the Ice Age and clues to life on other planets. "After excluding all known contaminants, bacterial DNA was found that does not match any known species in world databases," Sergei Bulat of the St Petersburg Nuclear Physics Institute told RIA. 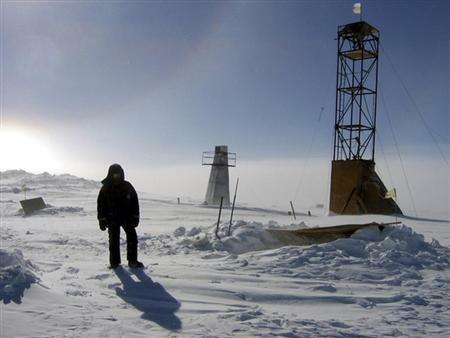 A man stands near drilling apparatus at the Vostock research camp in Antarctica in this January 13, 2006 handout photograph. "If it (the bacteria) had been found on Mars, then without a doubt we would have said there is life on Mars - but this is DNA from Earth," he said. "We are calling this life form unidentified or unclassified." Scientists from the United States and Britain are close on Moscow's heels to probe what life may exist in one of the most extreme environments on Earth. This year, a U.S. expedition said they had seen living cells under a microscope in field samples taken from the shallower subglacial Lake Whillans, but more study is needed to determine what kinds of bacteria they are and how they live. A British effort to reach a third body, Lake Ellsworth, was called off in December because of problems drilling. What life is found in the icy depths may provide the best answer yet to whether life can exist in the extreme conditions on Mars or Jupiter's moon Europa. The Russian discovery came from analyzing water that froze onto the end of the drill bit used to bore through to Vostok - the largest of a network of hundreds of lakes under the ice cap that acts like a blanket trapping the Earth's geothermal heat. Bulat and other members of Russia's Antarctic mission could not be reached for comment to Reuters on Thursday. But Bulat told RIA that scientists are waiting for more samples from the lake to confirm their discovery. Because of the technology used to keep from polluting the pristine lake, Russia will only obtain clean water samples - uncontaminated by drilling fluid - for analysis later this year. To answer concerns kerosene and anti-freeze from the borehole would seep into the lake, Russian engineers withdrew the drill to allow the water to percolate up into the borehole and freeze there, only returning this year to collect it. But Bulat said the unknown microbes were found after separating out species of bacteria that are known to exist in the drilling fluid. "When we tried to identify the DNA, it did not coincide with any of known species. 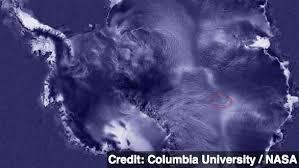 It's degree of similarity was less than 86 percent," Bulat told RIA. "That is practically zero when working with DNA. A level of 90 percent tells us the organism is unknown." Frozen samples from deeper in the borehole collected during this year's Antarctic summer season in February are now being carried back by boat and are due in St Petersburg in May. "If we again identify the same group of organism in that pure sample of water, then we can confidently say we have found new life on Earth," Bulat said.